Once a family has added their data via your account link, they need to be accepted. Accepting new families takes only ONE step. Families must be accepted to be viewable in the system (both by admin and parents) and to get directory access and receive emails. 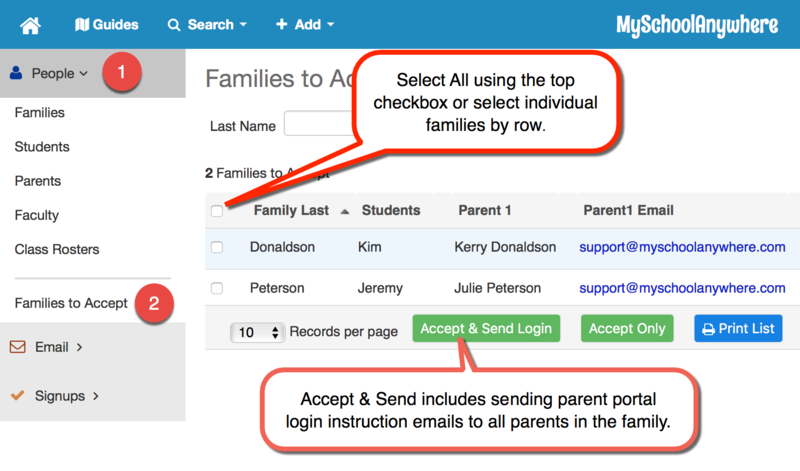 Go to People / Families to Accept or click on the View next to the New Families to Confirm in your School at a Glance. Before you confirm you can print a report of families you are activating by clicking on the Print List button. Tip: Your primary account email will receive notification when a new family is waiting to be accepted. This email is sent once a day if there is account activity. Note: Choosing Accept Only doesn't automatically give parents access. After you accept, go to Portal Access to grant the new parents access. You can avoid this extra step by instead choosing Accept & Send Login.